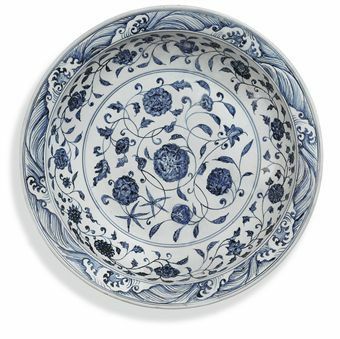 Notes : Compare very similar foliate-rim dishes of this same pattern, illustrated by J. 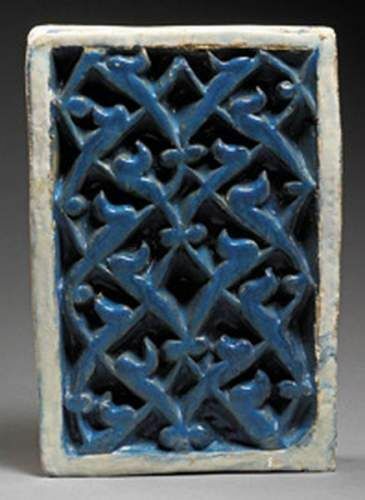 A. Pope, Chinese Porcelains from the Ardebil Shrine, pl. 35, nos. 29.101, 29.106, and 29.109; one illustrated by R. Krahl, Chinese Ceramics from the Meiyintang Collection, 1994, no. 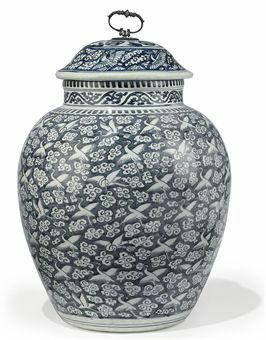 662; from the National Palace Museum, Taibei, illustrated in Blue-and-white Ware of The Ming Dynasty, Book I, Hong Kong, 1963, pls. 22 and 22a; and the dish formerly from the collection of Mrs Walter Sedgwick, illustrated by J. Harrison-Hall, Ming Ceramics in the British Museum, London, 2001, p. 116, fig. 3:35. 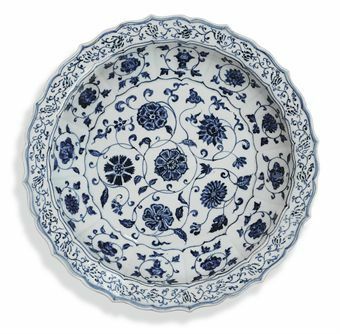 For a discussion of the evolution of the design onto Ottoman wares of the early 16th century with illustrated reference to examples of the Chinese prototype and the Iznik equivalent in the British Museum, see J. Rawson, Chinese Ornament: the Lotus and the Dragon, London, 1990, p. 185, fig. 163.